The Bellevue Gazette first appeared on October 23, 1856, in "Bellevue City" or Bellevue, Nebraska Territory. The paper was published by Silas A. Strickland & Company and described in 1882 by Alfred T. Andreas as follows: "This ambitious sheet seemed, like its jovial and well-known editor, to desire to please everybody. In its first number it unburdens itself of its intentions in a salutatory, promising the publication of all the newest inventions for the benefit of the mechanic; of the latest news from St. Louis papers; and of letters from the farmers. In the same issue are set forth the excellences of the Bellevue House, and the readiness of various individuals to barter good for cash or land for either. There is also a brotherly pat on the back for the Nebraska Democrat, then a novelty in Omaha journalism." Early issues had six columns of print. Although Bellevue had lost its bid to become the territorial capital, it was designated the county seat of Sarpy County. According to the Gazette in 1857, the city had 90 houses, making it a good-sized community for its time. Bellevue was noted for its prosperous boat service across the Missouri River and for outfitting emigrants heading west to seek land and fortunes. The community was also an important market town and boasted two large hotels and a bank as well as the newspaper. 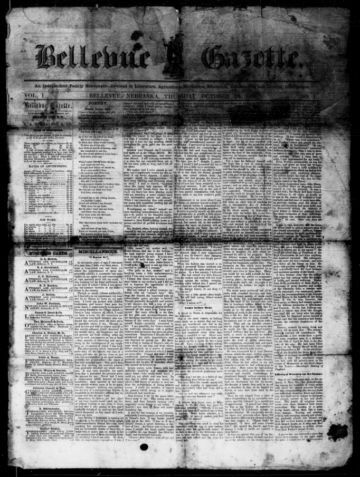 The Bellevue Gazette folded in October 1858—thus lasting a mere two years.